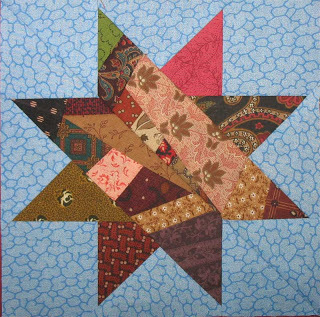 About 10 years ago I made some scrap stars on a blue background, and they have sat in the UFO pile ever since. I was experimenting with ways to foundation piece Le Moyne stars, and I liked the results but wasn't really taken with the method. 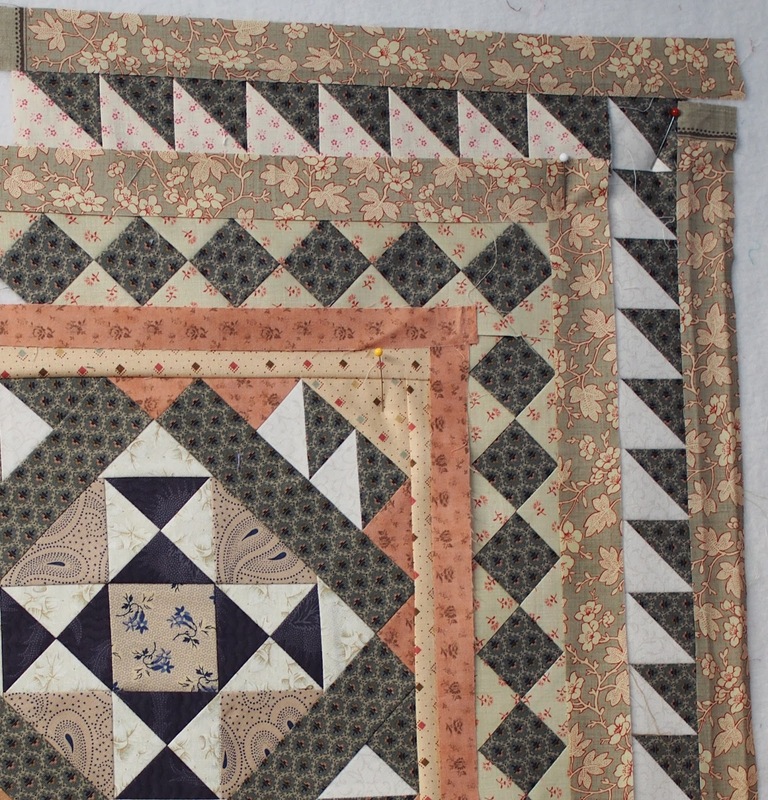 I made 9 and called it quits, and pieced a huge pile of scraps into the sashes and border. 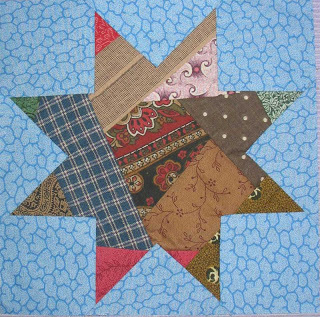 I tried numerous times to give them a fancy pieced border, and nothing looked good. So I just slapped a triple border on it and called it done. This is the exact opposite of the immense amount of care I took with the borders on the grey quilt, but that doesn't bother me. It's not as if I didn't try to do something more elaborate, but I just couldn't come up with anything that struck me as Right. 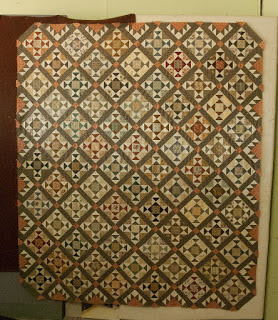 So now this is a little wallhanging or lap size quilt, and I'm happy to cross another one off the list. I'm down to 19 UFOs now, and I can't wait to get another one out of the box and start working on it. I have a busy Easter break planned, lots of traveling and visitors, so nothing will happen for a while. When I do get some time I'll be sewing with a passion. On Friday Mereth and I went down to Adelaide for my DD's baby shower; Shonny has only 6 weeks to go, and we're all getting pretty excited at the thought of another baby girl in the family. We took the dogs with us, as we weren't sure how long we'd be away; they are old hands at traveling, so it was an easy trip with them. 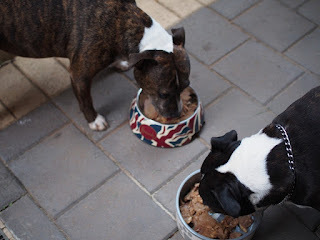 For dinner on Friday night they had bowls full of roast beef; until recently Shonny was working at a restaurant and they threw out so much meat from the carvery each night. She started bringing some home and freezing it for our puppies, so they have a lovely treat when they come to stay. Harrods of London! 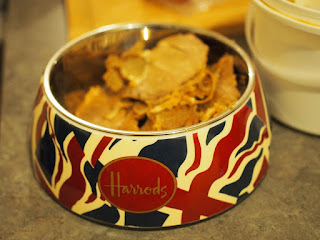 Our friends brought it back from England as a Thank-you gift for babysitting the farm and Tawny. I laughed and laughed when I unwrapped it, what a brilliant souvenir. They wanted to bring one back for Pippi too, but they didn't have room, so Pips has to share. Dolly is such a fusspot about her food, this just reaffirms her conviction that she's Royalty. We came home late last night, and I was too tired to do anything except sleep; however this morning I tackled the last borders on the grey quilt. 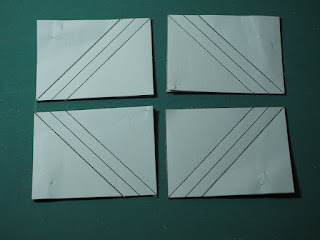 I made no attempt to make the borders the right length, I just sewed together enough triangles so that I had four strips a bit longer than each side. 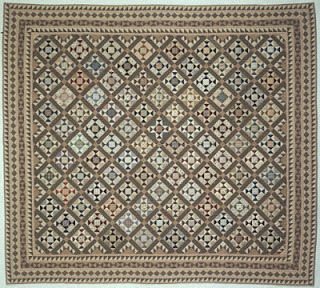 I lined the start and end up with the border, and pinned the triangles to the border until I could see how much excess there was. Then I just took tiny extra seams between the triangles until the triangles matched the border. I only needed to take a tiny seam, just a few threads away from the existing seam. That took one eighth of an inch off each time, so I only had to adjust between 4 and 6 seams each side. It was a lot easier than getting out the tape measure and the calculator. 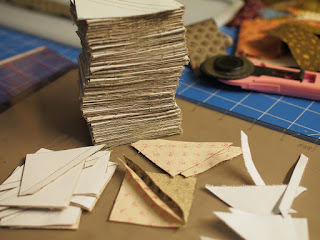 Today I've been shuttling back and forth between bookwork and the sewing machine, swapping from one to another every time I got sick of what I was doing. 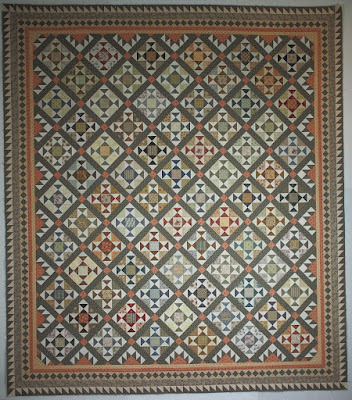 Early in the day the sewing was a welcome break from the tax matters, but as the day wore on I was relieved to stop working on those troublesome borders and go back to the paperwork. 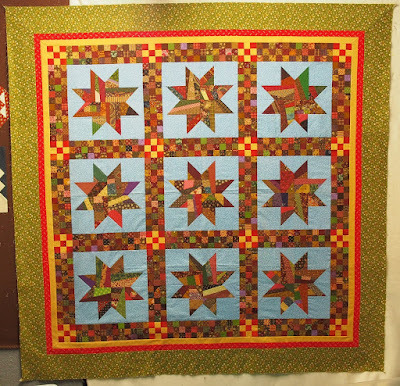 My Wordy, Lordy Me, this quilt has been a lot of trouble and bother and it's still giving me fits. The end is in sight though. I have the final triangle border to attach, and then it is DONE! I love how it's turning out, but I've put so much effort into it. I know I have to keep on until it's finished, but there has been no time for anything else. If I'd known how much work was in those little squares on point the whole lot might have gone back into the cupboard for another three years! And I had to change the border fabric too, that beautiful French General print was just a tad too light so this murky blue-grey was substituted. 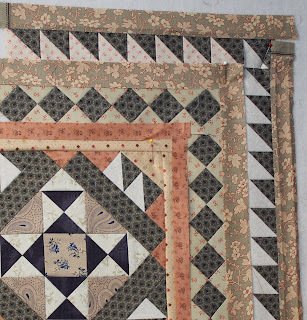 I have the majority of the last border pieced together, I just need a few more triangles and then I can attach them around the outside. 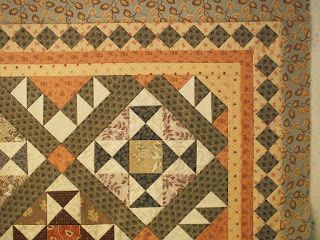 I don't expect it to be easy, because very little about this quilt has been easy, but it's just something I need to stick at until it's all done. 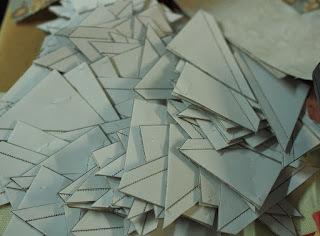 I have an appointment with this pile of triangles, tearing off the paper and pressing them; if I get that done tonight I"ll be happy, so I'm off to watch NCIS with a cup of coffee and the waste paper bin. Tomorrow I'll be all set to tackle that last border. It's a long weekend here in South Australia, and it's lovely to sit here and plan what I"m going to get done in the next three days. It's tempting to put really big jobs on the TO-Do list, but then the whole weekend is hi-jacked by them, so I'm going to try and be a little more realistic. For the last few weeks, Mereth and I have been giving each other a little challenge as we leave work on Friday. We each pick one thing that we will have done before we come back to work on Monday, and it's been fun to try and knock those goals over. 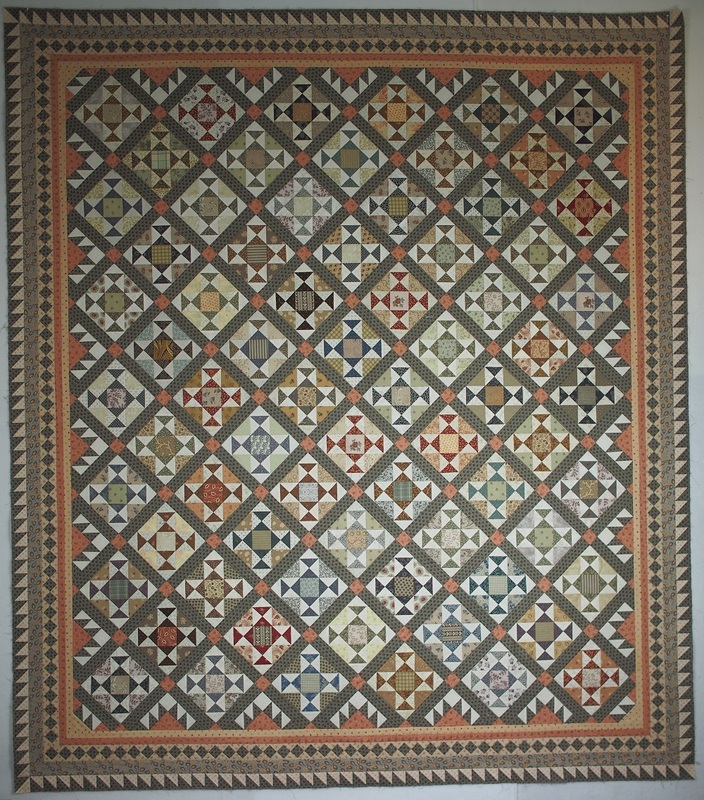 Last weekend I wanted to choose the borders for the grey quilt, and I achieved that. 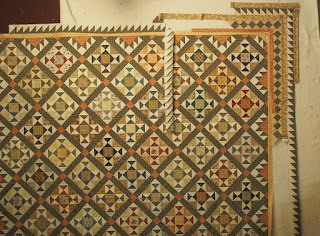 This weekend I would like to have all the piecing finished, and some of them attached. 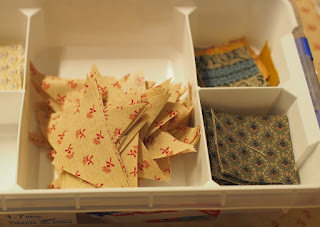 I've been working on several computer things during the week, and in the scraps of spare time I cut and sewed the units for the two pieced borders. I work all the measurements out in AutoCad Lite; it's very handy to own such a brilliant drafting program, a legacy of my Survey Drafting days. 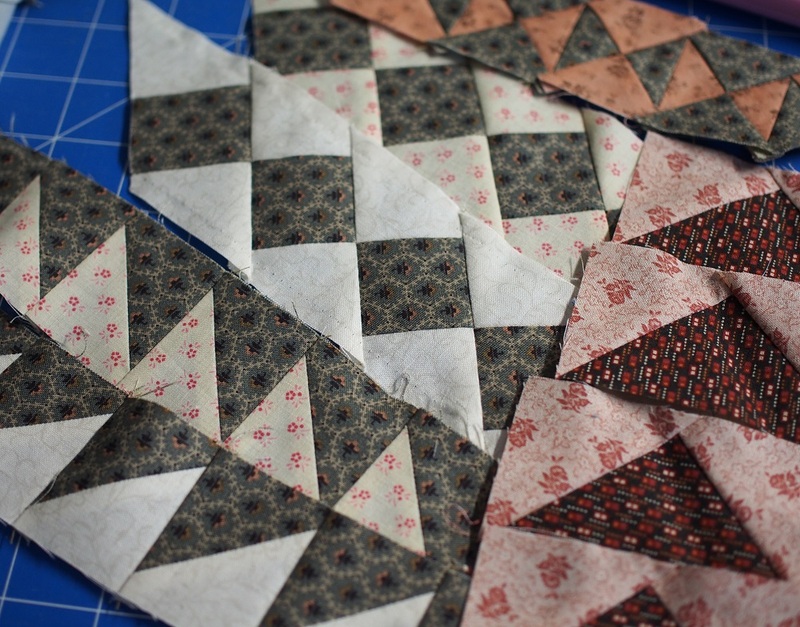 The HSTs around the edge are 1.414", which is the long side of 1" HST; it's also the size of the little triangles in the blocks, and the setting triangle blocks. 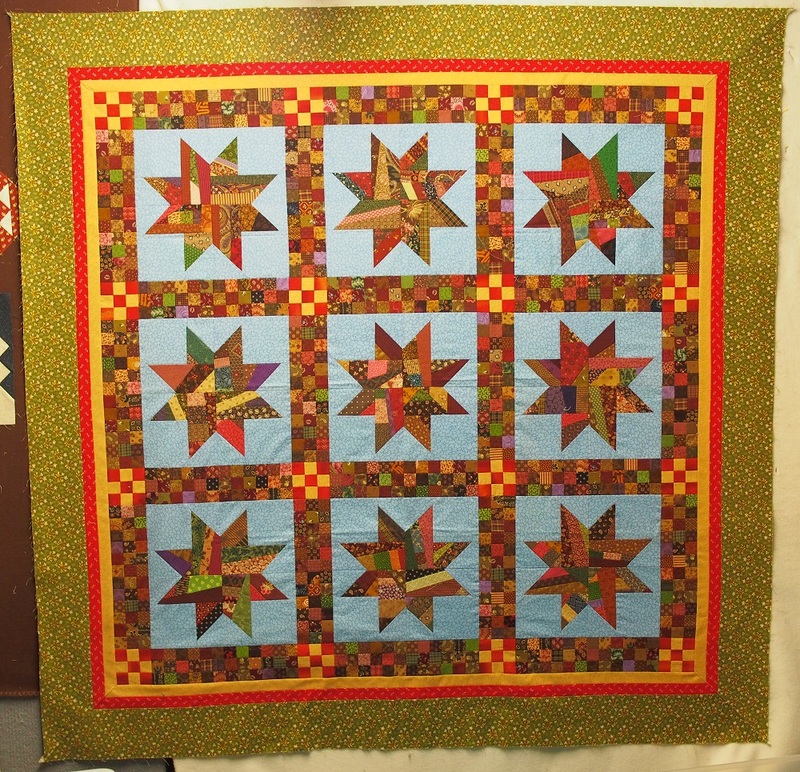 I chose to stay with that size so that it would visually link the border to the blocks. 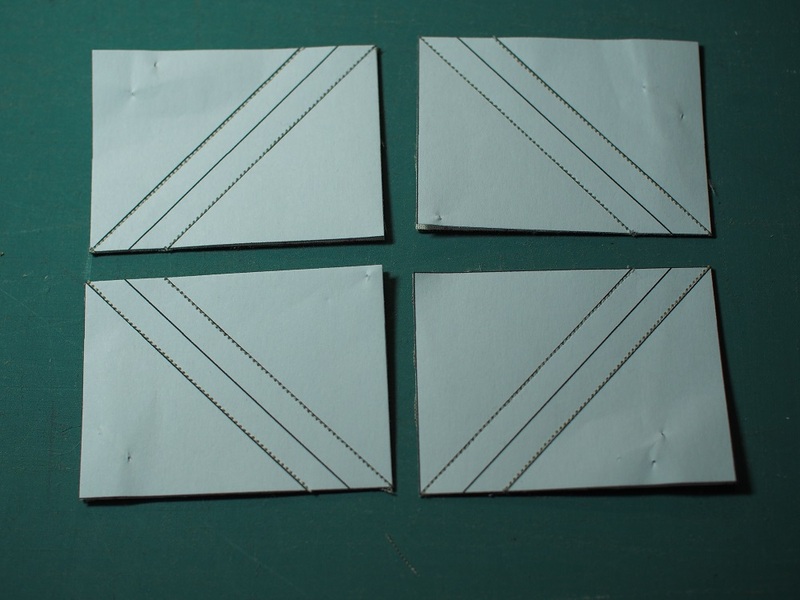 I couldn't cut that with a rotary cutter, but I have a paper triangle template that I draft up for those sort of strange sizes. I suppose I could have just gone with a 1.5" HST, but I find that the accuracy I get with the papers really makes those long borders go together easily. I need a couple hundred units, and I don't want to be trying to fudge inaccurate units together. 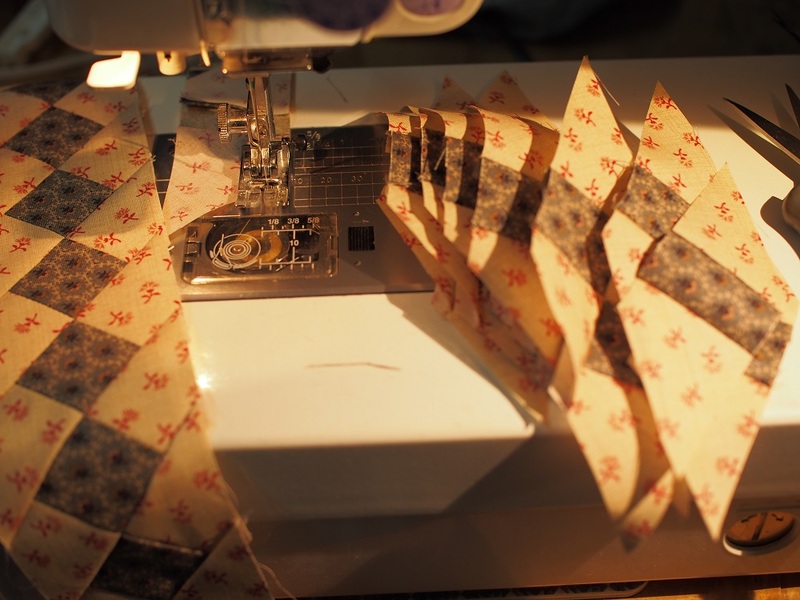 And the sewing is so quick, just follow the lines. I did this stack of 30 templates in half an hour, and that's all the triangles I need for the outside border. Then in another lot of stolen moments I trimmed them, and cut them apart. I don't bother using a rotary cutter to cut those pairs; it's not a line that needs accuracy, so I do it sitting down, with sharp scissors, a cup of coffee and something interesting to watch. Makes that chore seem pleasurable. 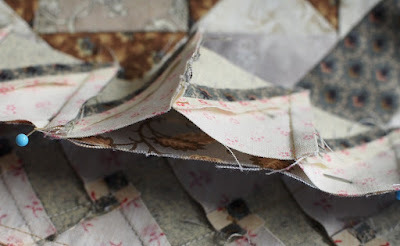 Now it's a matter of taking the papers off, and pressing those seams open so that they are all nice and flat, ready to sew together. I can do that in little increments between other jobs, and it never gets too tedious. The units for the first border are all cut and ready to sew; they are pretty time-consuming too, but once I get into the swing of it I can get a lot done. 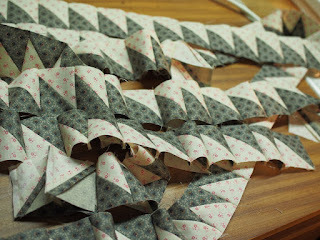 I tend to sew them in batches of ten, and that makes it easy to see progress. I need a couple hundred of these too. Once I have all these units done there will be the mind-numbing job of making them all fit around the centre blocks. I've done a rough plan on the computer, but the reality will be different. The blocks don't measure what they should, the overall measurements of the top are nearly an inch bigger than the drafted version on the computer. There are a lot seams, and just a tiny bit extra in each block added up to something significant. I'm going to do my favourite Wing It approach; join the strips at the corners, the way I want them to be, and fudge something in the middle. 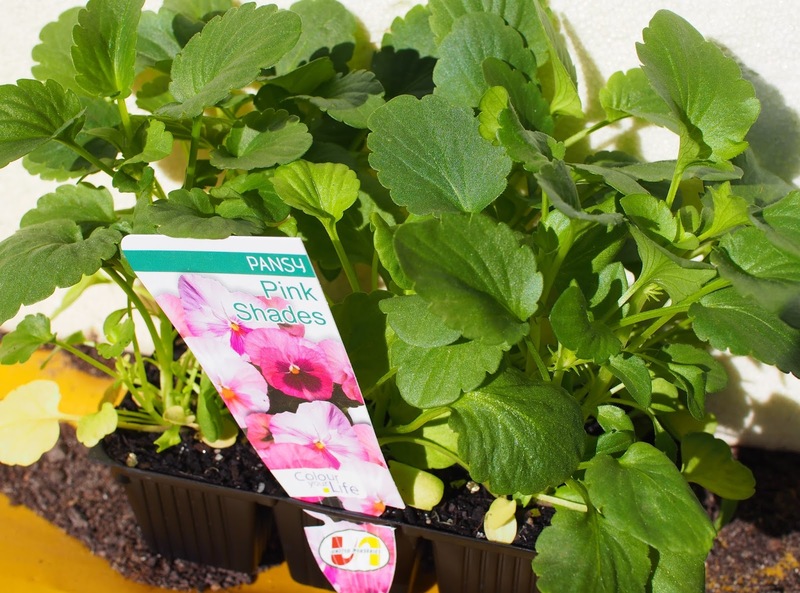 Usually taking larger seams between a few of the units will ease in any fullness. 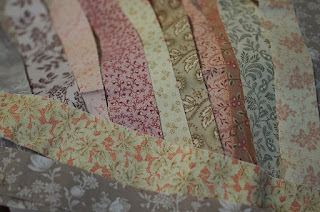 I can't say I'm looking forward to that, but I am really looking forward to having this quilt DONE. The only way out is through, and I just need to keep working at it. I will work at it later on; right now I have a date with some seedlings for the autumn garden. Some outside time is needed, to balance all that inside work. I have five long-term UFOs on my list, all at the border stage. They are packed away in the cupboard and I don't think of them much, but they need to be dealt with. They are unfinished because the border decisions were just too HARD! 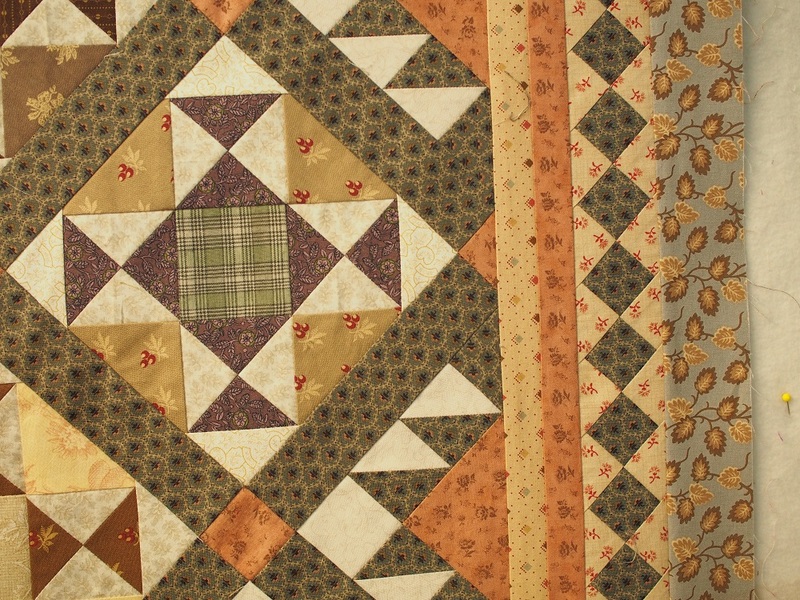 Sometimes a quilt just goes together without a hitch, and sometimes it fights every inch of the way. it's taking up two large containers, because I packed away all the fabric I was using and all the fabric I was likely to use, plus the paperwork and photos. It took me a while to sort it all out and remember what I was aiming for. Thank heavens I put all my notes in with the top. 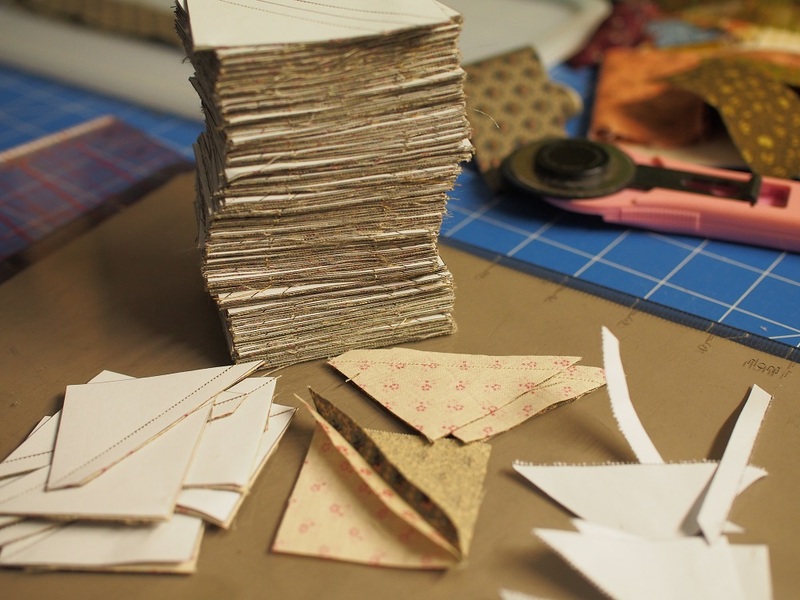 I spent hours cutting tiny strips to audition for the pieced borders; nothing was right. Every piece was either too brown, too pink, too blue, too light, too dark, too bright. This is why it's been marinating in a box for three years! On the plus side, now I have all these little strips that are just begging to be used together. 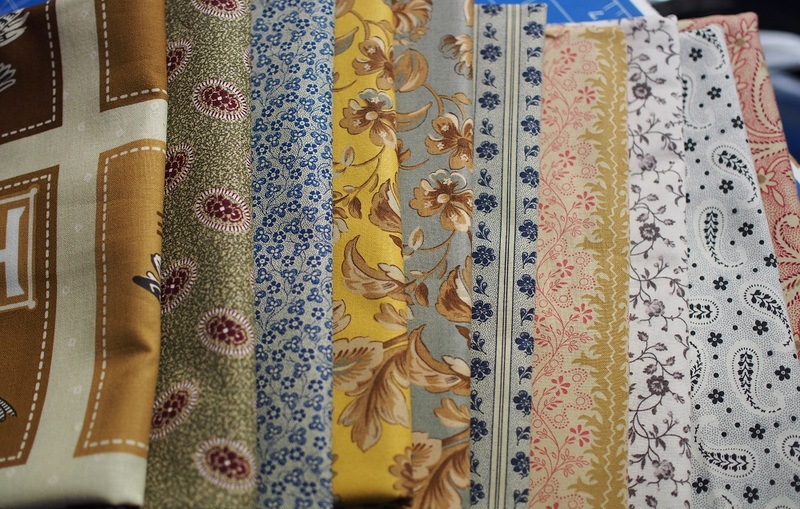 Such lovely fabrics, but none of them are what the quilt needed. Finally I've come up with a plan. 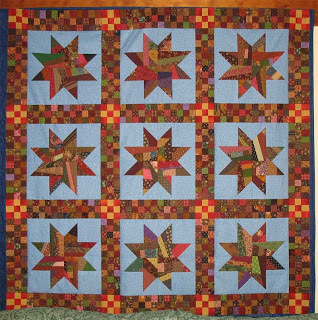 The original quilt had multiple pieced borders, but I couldn't include them all or my quilt would be enormous. 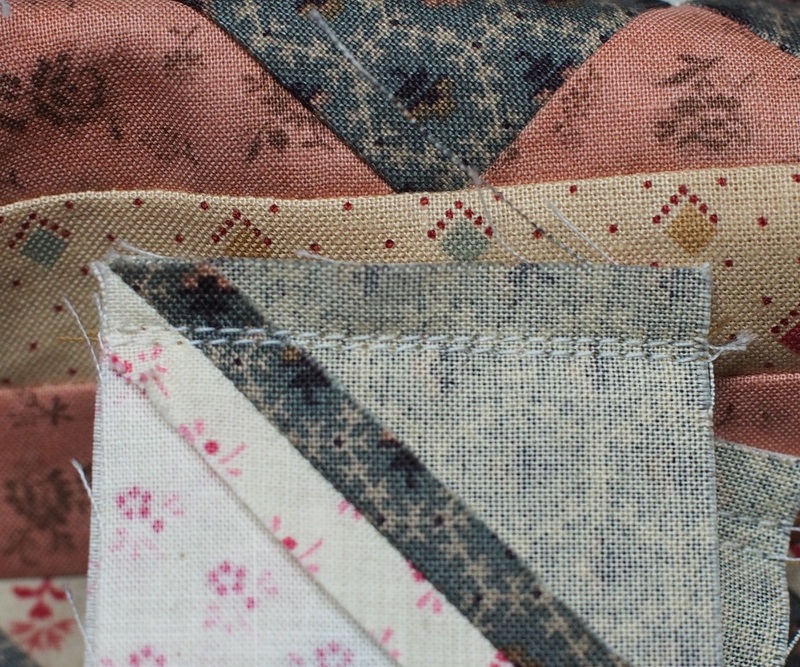 I've sewn the missing corners onto the main part, made some mockups of the border piecing, worked out all the measurements. I eliminated the dark hourglass border, and chose to use the HSTs and the squares on point, plus several spacer strips. 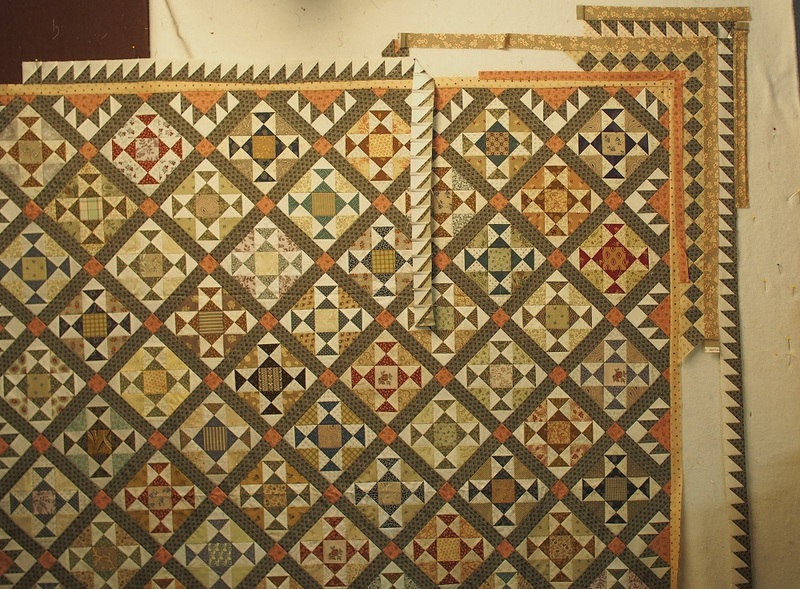 Now it's time to square up the edges, add the first border and cut out several hundred squares and triangles. I made myself keep at it, because packing it away again would just mean a rerun of this day sometime in the future. I can see why people buy kits, with all the hard decisions made for them. But I will have a sense of achievement once I've battled all these design elements into submission. I really love the blocks and the fabrics and the memories of this special top, so the border is worth all the effort. It will be very sweet to cross this off the UFO list. My parcel from Hancock's arrived, and it was fun to unpack. Two things were back-ordered, so the total was 43 yards. 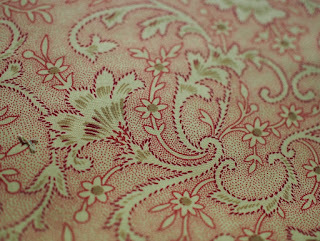 Hancock's are very generous with their cuts, so there was an extra 3 or 4" in the long lengths; I'm putting it in my fabric tally as 43 metres. I gave two pieces to Mereth, so that took the overall figure down to 39m. I must have been slightly insane when I ordered that lot! I was definitely out of control. 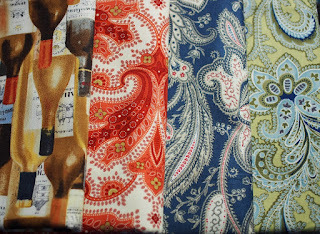 That red paisley is looking very orange in the photo, but it in real life it will be perfect for one of my red and blue quilts. 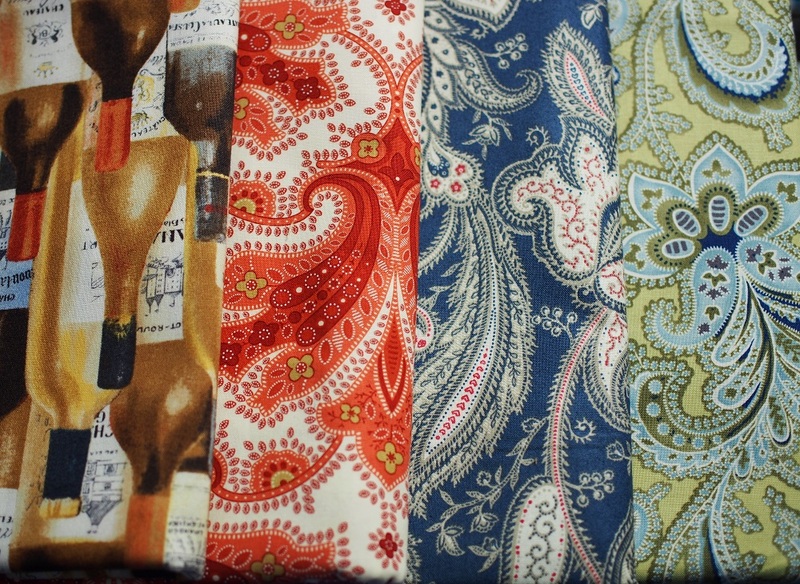 The wine bottles will go on the back of a quilt for a wine-lover in the family; the other two paisleys would suit a number of my tops, so I'll pull them out and see which ones look best. Batiks! I have very few blue batiks, so these will help pad out the stash. 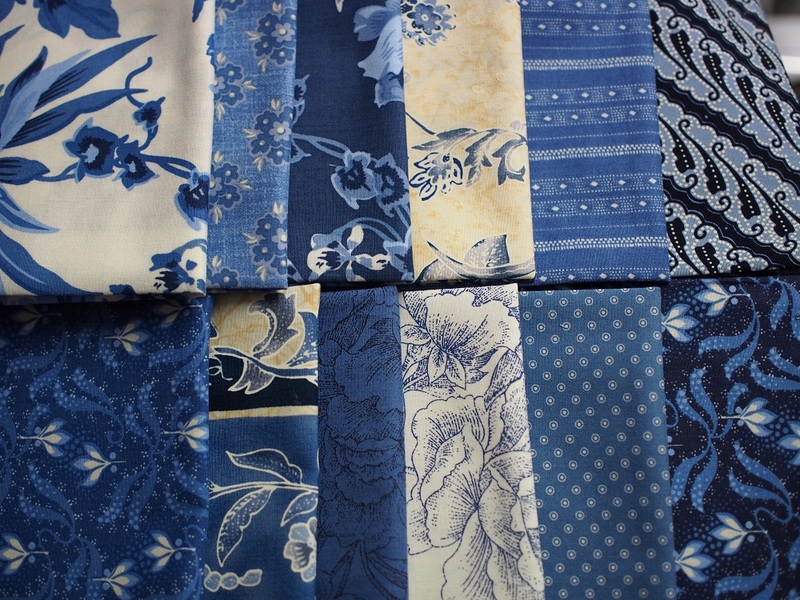 I bought enough of the blue-grey for a border. 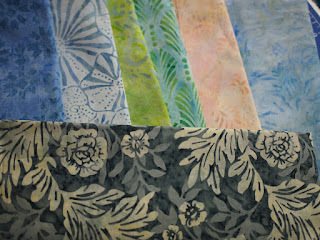 Can't wait to start the next batik project. 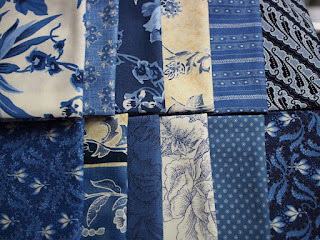 These blues from Marsha McCoskey are unusual, but they will liven up the blue stash too. 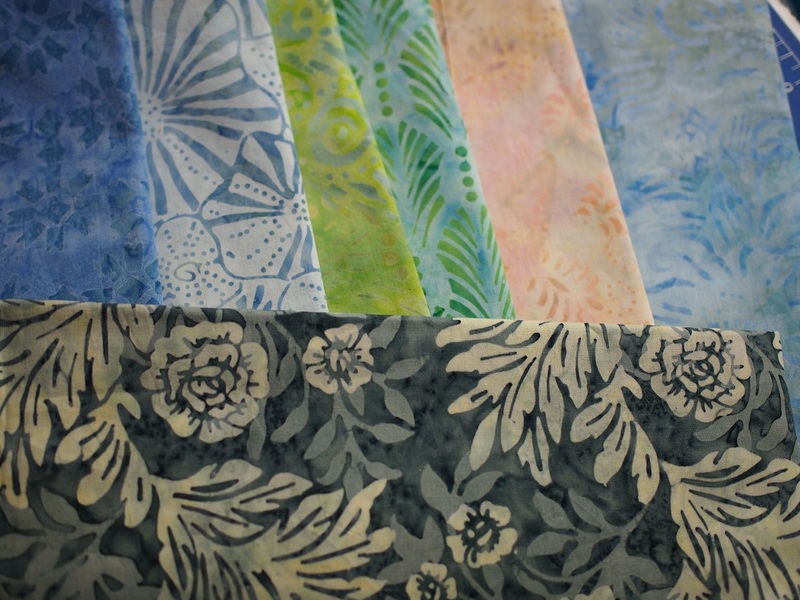 These are mostly 1 yard pieces; there aren't any plans for these yet, but I'm sure they will be starting points for new projects, especially the Betsy Chutchian florals. Yummy. 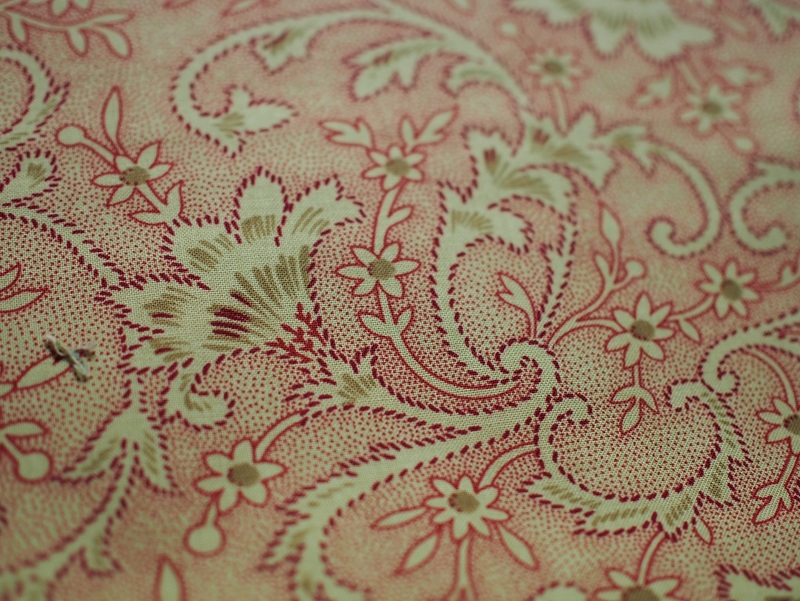 This print is so gorgeous I had to get 2 yards; I think the range is La Vie En Rouge. 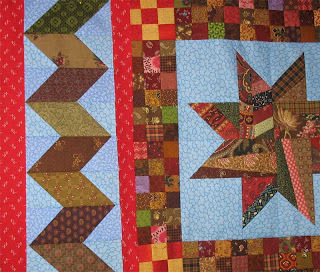 Maybe it will be a sashing, or alternate blocks, or a border. I'm super happy to have this on the stash shelf. So that's my huge extravagance for this year. It's helpful to take photos of the fabric purchases; later on I will probably forget where all these pieces came from so at least I have recorded it here. I used to keep a fabric book, but I found it hard to keep it up to date. And photos don't take up any space on the bookshelves, so I'll probably keep doing it this way. I just hope I don't have any more gigantic parcels like this one to upset my Fabric Tally!